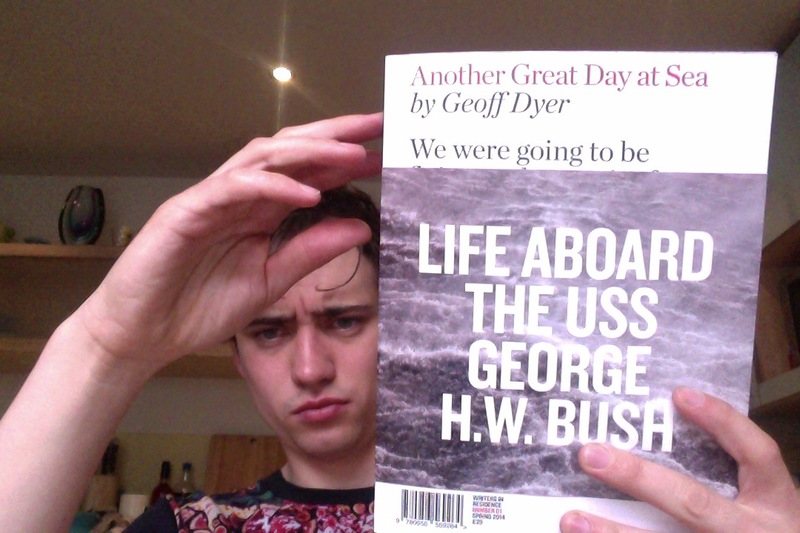 Geoff Dyer is one of my favourite writers, despite two of the books of his I’ve read being pretty mediocre. The reason is thus: Geoff Dyer writes excellent, beautiful, evocative, informative and charming works of genre-crossing non-fiction, but Geoff Dyer also writes rather uninspiring novels. * This one, Another Great Day At Sea, is thankfully non-fiction, and is thus both very entertaining and offers a shitload of details about something I previously knew nothing about. Accompanied by the photographer Chris Steele-Perkins (whose lovely images illustrate the book), Geoff spent a fortnight on the USS George H.W. Bush**, an active-service aircraft carrier located in the Persian Gulf. Obviously, to a man as passive and pacifistic as myself, this does not sound appealing – but (as I’ve probably said before) the real strength in Dyer’s writing is his ability to make things I have no interest in absolutely fascinating. And he achieves this through his use of humour, lots of detail and a self-depreciating streak that still feels honest despite his long-running and multi-award-winning career. In Another Great Day At Sea, he speaks to the captain of the ship, to a visiting Rear Admiral, to the on-ship dentist, the cooks, the security guards, the pilots, the chaplain, the technicians, the logisticians: those at the bottom of the pile, those at the top and those on pretty much every level in between. He is friendly, and so are most of the crew – most seem to enjoy the intrusion of a gangly, fifty-something Englishman into this very American environment, most seem to enjoy, too, the attention he gives. Particularly gripping is a passage detailing a “man overboard” scare, one where he speaks to a woman whose ex-husband left the Navy due to drug abuse problems is great, but to pick out individual sections seems to defeat the point – this book is detailed because of its wide scope, because of Geoff’s attempt to render the structure of the aircraft carrier both in terms of its workforce and its (more literal) architecture. The book is very, very, funny – I was laughing aloud in many public places reading it, at one point having to stop in order to calm myself down. I now know a lot about the US Navy (which I never thought I would), and I’m very inclined to read some more Geoff as soon as possible. For anyone with an interest in novelistic non-fiction, in Dyer’s other work, or even just in the military, I would highly recommend it. A witty, engaging and informative read. * I haven’t read all of them, so feel free to disagree. ** Geoff always italicises this. Oh, and he’s definitely Geoff, not Dyer.